Years ago, we began introducing our 4-year-old son to the worship service, with all the potential misbehavior that entails. During corporate prayer he decided to lie down on the floor. Like a good dad I knelt over and told him to get up. Like a good son he obeyed, immediately and enthusiastically. A little too enthusiastically. As he jumped up, the full weight of his 95th-percentile-sized head drove directly into my semi-opened jaw. My teeth sank into my tongue before sending the rest of my cranium upward, and for a fleeting moment I saw stars. Somehow I managed to make it through the rest of the service with a growing dull buzz inside my head. The incident gave me a new perspective on impactful worship. Not every instance of bringing our kids to the worship service is like that, of course, but it can be a difficult transition, both for our little ones and also for us. So if it’s that hard, why would a church encourage kids (not necessarily babies) to sit in worship with their families? Here are four areas why I believe this is helpful: discipleship, education, tradition, and opportunity. At the core of Jesus’s Great Commission to his disciples (Matt. 28:18–20) is the call to make disciples of all nations—that is, all people groups. The “all” includes the very people within our own families, and the commission is not restricted to age. And making disciples is never an abbreviated event. The words of God should be taught to our own children today. A corporate worship service in which Scripture is read, sung, prayed, and preached helps us as we educate our kids. The art of listening to a sermon is not something easily obtained in our soundbyte- and social media-driven culture. There’s virtually nowhere else kids will learn this skill. Someone introduced to a worship service as a teen will have a much more difficult time learning how to listen to sermons than one who’s been raised to slowly appreciate the intricacies of this unique (and biblical) form of communication. Sitting in the worship service teaches them how to worship by listening to God’s Word—an invaluable skill for any Christian. Evangelicalism has a long history of eschewing tradition. You might say it’s our tradition to not think much of tradition. But therein lies the rub. While we are right not to blindly serve tradition, there is no biblical prohibition on allowing tradition to serve us and our children. During my childhood, I was powerfully influenced by my grandfather giving the offertory prayer as I stood and sang beside my grandmother, who had the hymnal memorized. Jude urges his readers to “contend for the faith that was once for all delivered to the saints” (Jude 1:3). The faith that was delivered to our predecessors is the same faith now being entrusted to us. While it’s possible to pick up bad habits from tradition, it’s also possible that tradition will guard us from falling into error. When novel teachings arise in the church, their very novelty can be a warning: If no one’s ever thought or done this before, is it wise for us to start now? Even if our kids don’t at first understand everything encompassed in the readings, singing, and preaching—and make no mistake, they won’t—they will at least understand the people who love them and stand beside them. This proximity gives us a prime opportunity to explain what they don’t grasp. Children hear more than you think. You’d be surprised at what 4-year-olds ask when you assume they’re tuned out. In worship, we have the opportunity to introduce our kids to a taste of the eternal—God’s saints celebrating him together. At the least, attending worship with your child may prompt them to ask you the reason for the hope within you (1 Pet. 3:15). 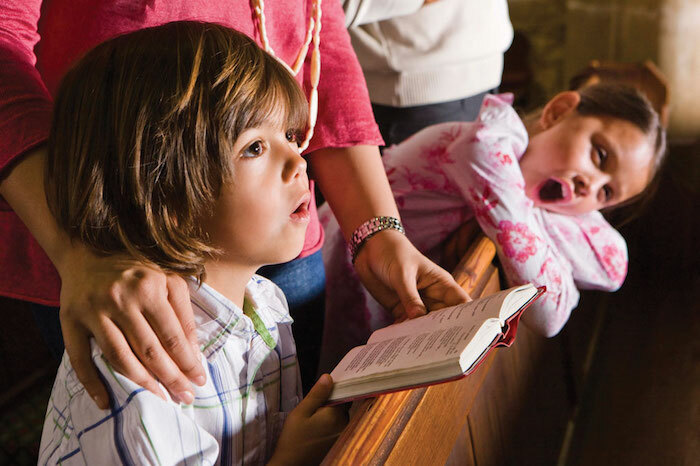 Transitioning kids to the worship service is difficult, but it’s a difficulty worth enduring. Yes, you may have a few months (or a few years) of distraction. But the distraction won’t last forever, and you’ll be building on something that will. Jared Bridges is vice president for brand advancement at Family Research Council. He lives with his wife and four children in Virginia, where he enjoys serving as the elder for family ministries at Occoquan Bible Church.